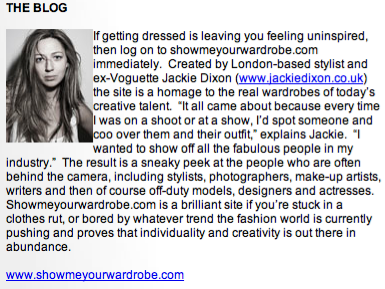 SHOW ME YOUR WARDROBE.COM: Show Me Your Wardrobe makes it on to Vanity Fair's A -List! Show Me Your Wardrobe makes it on to Vanity Fair's A -List! Thanks darling. Of course it was your post that did it...tipped the blog to another level! Congrats!!! I'm a great fan of your blog, recently seen your work on Fiorelli website...great stuff!! !